the Poynting vector the ﬂow of energy ﬂux. A static interpretation guide is shown below. The electric ﬁeld streamlines show the airwave as an interaction between two vortices; the earth vortex and air vortex. The centre of the earth vortex corresponds with the electric x phase inﬂection point a significantly small amplitude. The air wave front (per indicated by the dashed red line) represents the point where the contribution of “earth” and “air” energy ﬂow is equal. That is above the line is predominantly air wave energy and below the line predominantly earth energy. I have seen early CSEM papers in the past where they show an apparent 'direct wave'. While these papers made it easier for seismic specialists to understand marine CSEM, I don't really see apparent direct or reﬂected energy, however it appears to have “guided” energy ﬂow (see Weidelt, 2007) within the hydrocarbon and along the air-ocean boundary. Synthetically generated inline electric and Poynting vector field recorded ocean bottom amplitude and phase (Top two plots) with the associated electric and Poynting vector field streamlines (middle two plots) and my interpretation of the generated field. A.M. Pethick, B.D. Harris, Interpreting marine controlled source electromagnetic field behaviour with streamlines, Computers & Geosciences, Volume 60, October 2013, Pages 1-10, ISSN 0098-3004, http://dx.doi.org/10.1016/j.cageo.2013.04.017. 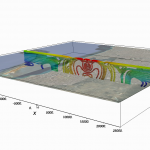 The final case shows the electromagnetic field generated by a MCSEM survey within a conductive 1D layered earth containing a 3D resistive hydrocarbon body. The video show how the streamlines tend to “avoid” more electrically resistive areas; either bending around resistive bodies or “jumping” across the resistive area along the shortest possible path. 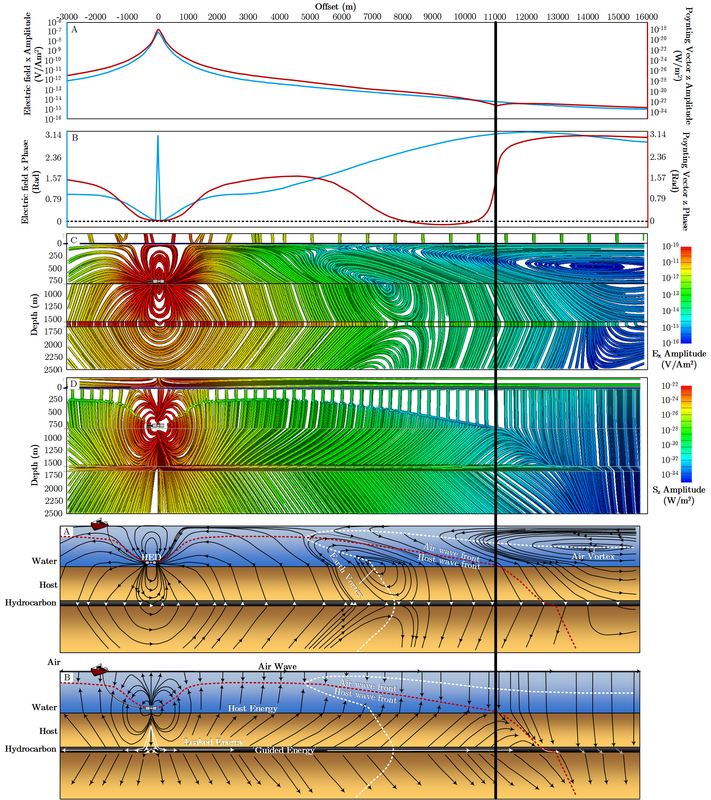 In particular note how the streamlines travel perpendicular across the high resistivity reservoir (i.e. the resistive slab). Conversely the electric ﬁeld streamlines tend to concentrated in the more conductive geo-electric features. Let's also not forget the size of the fields we are dealing with. The EM Fields are REGIONAL SCALE! 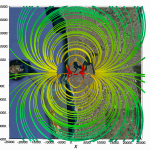 Generally the detectable electric ﬁeld streamlines generated by the lowest MCSEM frequency (0.1Hz), This is generated using an earth with an ocean depth of 1.5km and halfspace resistivity of 1.5Ohm m are overlaid above the city of Perth, Western Australia. These fields generated are massive! The engulfing electromagnetic ﬁeld is large (50km×50km×4km!!!) and would easily span the sprawling metropolitan city of 2 million people. Although many MCSEM surveys transmit using a higher base frequency and as a result will reducing the volume the detectable EM field will inﬂuence. Plan view of the electric field plot over my home town of Perth. Notice that this is regional scale, not local. This is due to the massively low transmission frequencies generated by the electric field bipole transmitter. Inline depth section of the detectable electric field. This can reach depths of up to 5km given a low transmission frequency and resistive earth. Pethick, Andrew M., (2013), Multidimensional computation and visualisation for marine controlled source electromagnetic methods. PhD Thesis. Curtin University, Australia. Pethick, A., and B. Harris. "Poynting Vector Streamlines and the Marine Controlled Source Electromagnetic Airwave." 75th EAGE Conference & Exhibition incorporating SPE EUROPEC 2013. 2013. Pethick, A. M., and B. D. Harris. 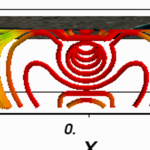 "Interpreting marine controlled source electromagnetic field behaviour with streamlines." Computers & Geosciences 60 (2013): 1-10.